Awesome you're giving this away. I got an ARC for an interview with Kristi later this month. It's really good. I'm looking forward to Tora trying to save humanity, and how she does it. It sounds like an exciting book. Thanks for having the giveaway. This sounds like a very exciting read. Well, I have to say, having a pet gun sounds seriously interesting! It sounds like something I would enjoy! Thank you for the giveaway! 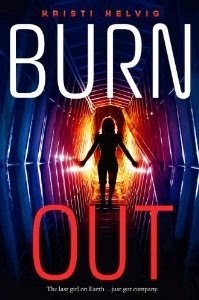 I've been looking forward to reading Burn Out ever since I saw the cover reveal. A sci-fi adventure sounds awesome! Havent read a scifi book in awhile. Sooo intriguing! Im very curious to read this book. Loved the story!!! I want something to pump my heart on summer!